Leverkusen – With the imminent introduction of tire labeling in Europe, the tire market will become considerably more transparent for consumers and particularly for car drivers. The fact that today’s tires have such outstanding properties is due to a large extent to the special-purpose rubbers developed by one of the pioneers of synthetic rubber, LANXESS. There, a team of experts is working hard to ensure that tire developers will have the materials they need tomorrow to give the next generation of modern high-end tires yet another boost in efficiency. The latest highlights from the LANXESS Performance Butadiene Rubbers business unit (PBR) include the ultra-high molecular weight product, Nd-PBR Buna CB21. Other promising special-purpose synthetic rubbers from LANXESS are now at the testing stage, for example the high-vinyl SSBR grades, PBR 4078. 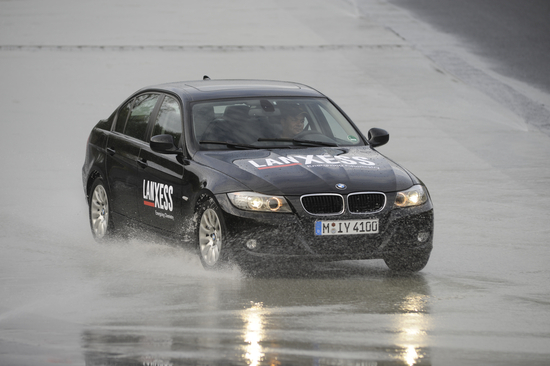 LANXESS rubbers will continue to shape the development of safer, more economical tires. This message will take center stage at the LANXESS stand during the 8th Intelligent Tire Technology Conference (ITT), due to be held in Darmstadt, Germany, from September 24 – 26. “The name of the conference – Intelligent Tire Technology – says it all,” according to Dave Hardy, Technical Marketing manager in the LANXESS PBR business unit, who will present a paper at this year’s ITT on the topic “Future chances for high technology materials in tires”. “After all,” he says, “tire labeling will make an important contribution to demonstrating not only to rubber experts but also to consumers just how much intelligence and know-how actually goes into producing a tire.” Through the use of modern grades of LANXESS high-performance rubber, the fuel consumption of present-day tires has already been reduced significantly: A fuel savings app developed by LANXESS shows that buying modern tires with a low rolling resistance can pay for itself after only two years, even with only moderate annual mileages. For Dave Hardy, there is still plenty of room for improvement. His work at LANXESS involves helping to convert consumer requirements into new types of rubber and thus enable customers to master the ever more demanding market challenges: “The latest state of the art is based on decades of intelligent research work. With rubber blends of functionalized SSBR and Nd-PBR rubber, combined with the blessings of the silica technology, it is already possible today to design tires that satisfy Class A. New synthetic rubber grades from LANXESS can create a fresh stimulus here. The ultra-high molecular weight NdBR Buna CB21, for example, contains only a few free chain ends and will thus have superior abrasion properties with low energy dissipation. The advanced LANXESS production technology also allows not only the continuous production of functionalized SSBR rubber via a smart polymer chain modification (among other things through the addition of cyclosilanes), but also the production of SSBR rubber with “unusual” styrene and vinyl contents. The prospects are that other new products such as PBR 4078 and PBR 4070 (high-vinyl and high-styrene grades) will display an improved Payne effect and improved low-temperature properties. They, too, are amenable to end-group functionalization. Other new developments are aimed at further improving the processing characteristics of the latest LANXESS tire rubber grades during compounding. “We are confident that, with these new types of rubber, we will be able to produce even better tires than before. Not only will they have even lower rolling resistance, they will also display even better wet grip and abrasion resistance,” says Hardy. “And that is exactly the same across the globe. It doesn’t matter which of our many production plants around the world actually supplies the high-performance rubber.